Stains Don’t Stand a Chance Against Teeth Whitening in Fayetteville! The holiday season is rapidly approaching, which means there’s a chance you’ll be asked to pose for a picture at a company or family gathering. If you have teeth stains or discoloration, though, you can be left feeling uncomfortable. Should you just go out and purchase a whitening kit from your local grocery store to remedy the problem? Your cosmetic dentist says, “No,” and explains why professional teeth whitening in Fayetteville is the best option for rejuvenating your smile! The professional whitening you’ll receive from your dentist uses high-quality bleaches to penetrate into your enamel to lift troublesome stains that can’t be addressed by merely brushing and flossing your teeth. You’ll be given custom-designed whitening trays to take home along with instructions on how to apply the gel properly. With this method, you’ll be able to see lasting results in as little as 7 to 10 days. The whiteners used in store-bought kits are inferior to those provided by your cosmetic dentist. It takes longer to see any results, and they don’t last long. There is a greater chance of irritating your soft tissues when using over-the-counter whiteners because the trays are not custom-designed to fit your mouth. A final problem with store-bought methods is that you’re likely to spend more money in the long-term. That’s because it’s harder to see noticeable results with store-bought kits. When you visit your cosmetic dentist for professional teeth whitening, along with looking better, you’ll also experience greater self-confidence. When your mental state is more positive, your body produces more endorphins, dopamine, oxytocin and serotonin – all hormones that are emitted when you are happy. These hormones then go on to fortify your immune system and create an overall healthier environment in your body. 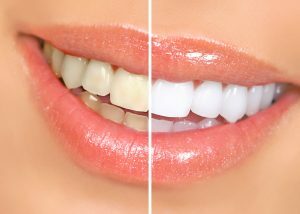 So by getting rid of those nagging stains and resolving any discoloration issues, teeth whitening truly rejuvenates your smile and positively impacts your life. To schedule a consultation to learn more about the process and get on the road to smile perfection, reach out to your cosmetic dentist in Fayetteville today! Dr. Angela C. Ruff is a graduate of the University of North Carolina at Chapel Hill. Throughout her career, she’s maintained a thirst to learn more, which is why she takes continuing education in such areas as aesthetic and implant dentistry. Dr. Ruff takes pride in listening to each of her patient’s needs and responding with the expert care they need. She eradicates stubborn stains with teeth whitening at Ascot Aesthetic Implants & Dentistry, and she can be reached for more information through her website. Comments Off on Stains Don’t Stand a Chance Against Teeth Whitening in Fayetteville!